To celebrate the HCPC approval of the Medipro Level 6 Diploma in Paramedic Practice, Medipro are giving one lucky person a FREE place on their 2 year Paramedic Programme! Unable to attend this year’s Qualsafe Conference, or do you just want to relive your Conference experience? We’ve put together a highlights video which helps to showcase what we got up to on the day of the event, so why not take a sneak peek and see if you can spot yourself in the background! The 27th April 2018 saw the return of the hugely successful Qualsafe Conference to the award-winning Royal Armouries Museum in Leeds. Firmly cementing its place as one of the UK’s largest safety Conferences, the event featured 10 thought provoking presentations and workshops from influential industry experts in First Aid, Food Safety, Fire Safety and Prehospital Care. The day also provided the perfect opportunity for hundreds of delegates to network with like-minded professionals, test their skills and meet with several leading exhibitors. Qualsafe Awards is pleased to announce that the Medipro Level 6 Diploma in Paramedic Practice, containing several Qualsafe Awards qualifications, is now listed on the Health & Care Professions Council (HCPC) register of approved education and training programmes for Paramedics in the UK! Qualsafe Awards has recently been made aware of some false statements on social media regarding our First Response Emergency Care (FREC) suite of qualifications. We would like to assure Centres and learners that Qualsafe Awards will continue to award the FREC suite of qualifications and that the purpose and audience of these qualifications remains unchanged. Our FREC qualifications are used throughout the country by a wide range of organisations, including the East of England Ambulance Service NHS Trust, Jigsaw Medical, Bristol Ambulance EMS, West Midlands Fire Service, Medipro and many more. Ideal for those working in a variety of prehospital care roles, including the NHS and private Ambulance Services, our levels 3, 4 and 5 FREC qualifications have seen unprecedented demand since their launch, with 7,000 learners being certified in the last 2 years. What’s more, this fantastic suite of prehospital care qualifications now also form part of the only HCPC approved vocational route to becoming a Paramedic in the UK! 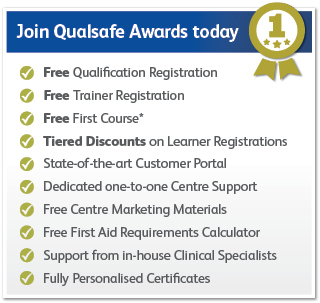 For further information or to find out how to gain approval to deliver these qualifications today, simply call 0845 644 3305 or email info@qualsafeawards.org. Our Managing Director, Nigel Barraclough is this year’s Federation of Awarding Bodies (FAB) ‘Individual of the Year’ 2017. With the Federation of Awarding Bodies representing over 150 awarding organisations throughout the UK, Nigel is incredibly proud to have won this fantastic award. As a prominent voice in the first aid industry, Nigel’s continued passion, innovation and dedication has resulted in huge advancements of first aid training standards, helping to save countless lives throughout the UK. Nigel would like to say a special thank you to all of our fantastic customers, whose continued support has been a key factor in him winning this prestigious award.